The winter Olympics just kicked off with the opening ceremonies from BC Place Stadium in Vancouver. 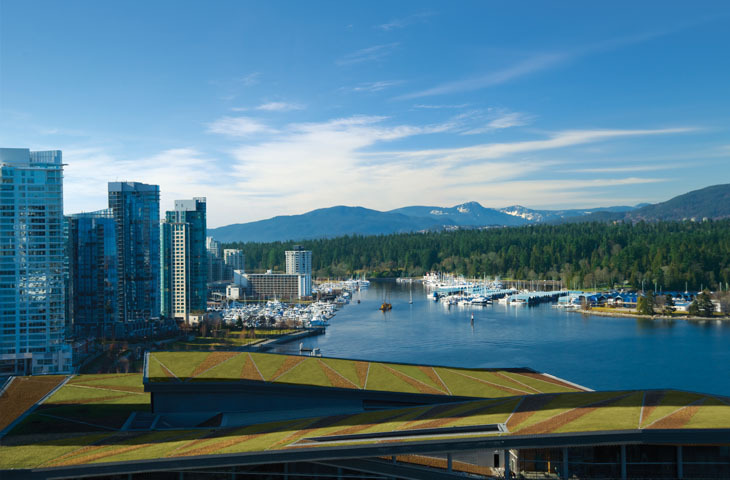 But serving as the International Broadcasting hub for the games is the Vancouver Convention Centre — the world’s first LEED Canada Platinum rated convention building. The 1.2 million SF center boasts a 6-acre green roof, which also now makes it the largest green roof in North America. The roof is planted with over 400,000 native plants and collects rainwater for irrigation which contributes to the buildings stormwater credits as well. Other interesting sustainable features include marine and shoreline habitat restoration. Fish habitat was actually built into the buildings foundations. The building also uses seawater for heating and cooling and incorporates on-site water treatment. The following video “Vancouver’s 6 Acre Living Green Roof”, posted on You Tube gives a great sense of the scale and context of the green roof. The landscape architect who worked on the project, Bruce Hemstock, discusses the plants used, soil media and the idea behind habitat linking into urban centers that is beginning to be made possible with the inclusion of more green roof in our cities. Interestingly enough he says one of the biggest challenges of the project was initially convincing people that it was the right thing to do.